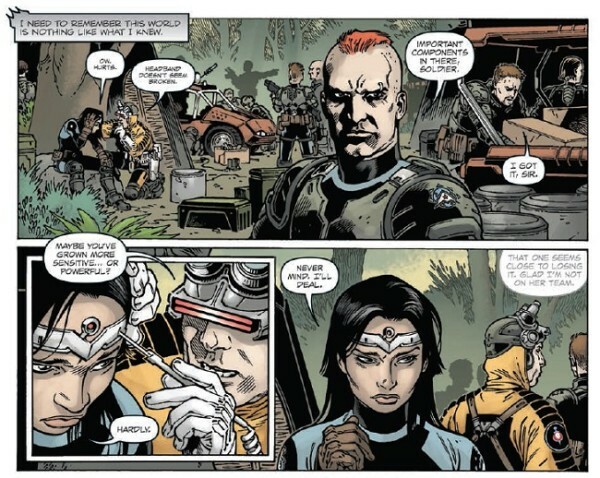 The first issue of Onyx saw the introduction of a complex future world populated by a vast number of characters and monsters. The Second issue contains a lot of fighting. And that’s the best way to sum this issue up. Onyx fights the Mutants for 4 pages then the military characters turn up and fight the Mutants for 4 pages then they all fight together for a bit longer. There’s even a fight related, yet confusing moment, in a nightmarish mental landscape where the urgency seems to be to ‘take out this goddamned frog’. The action is all bookended with the story of the villain, a mutated scientist who’s a cross between a cenobite from the Hellraiser movies and The Leader from the Hulk comics. 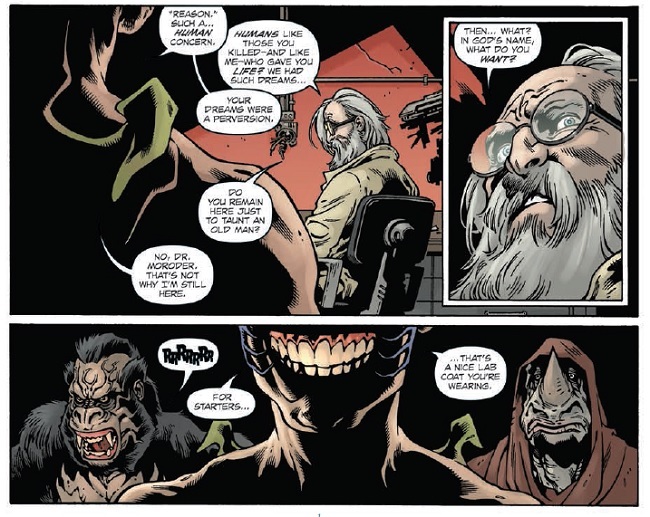 Rana proves to be the most interesting of the characters, despite featuring mainly as a mouth and chin throughout most of the pages. Onyx is captured and promptly rescued before ‘mercifully’ killing the unarmed, beaten mutant creatures scattered around the field. This is her only real piece of character development and it doesn’t give the hero much credibility. In fact her actions are as cold as her ice blue eyes and even though the mutants are violent, they come off as more likable because they at least have some kind of feelings. The script is over inflated and there is too much unnecessary speech that fills the already busy panels. There are also some leaps in the dialogue that force the conversations unnaturally down a particular route which in turn moves the story in the desired direction. 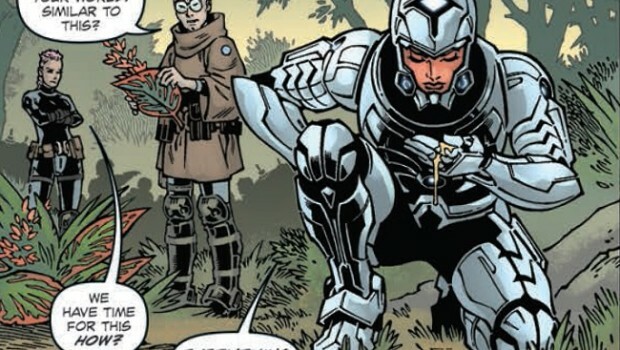 For example Cici notices the Captain has vanished but then Onyx brings up the ‘primitive weapons’ which leads into the characters rearming but they appear to have completely forgotten their missing comrade. The Artwork is very clean cut and solid throughout although some of the panels suffer from overcrowding, mostly as a fault of the speech. The colouring on the pages is what gives the Art, and story, a feeling of setting and tone; and because of this, it is the star of this comic. 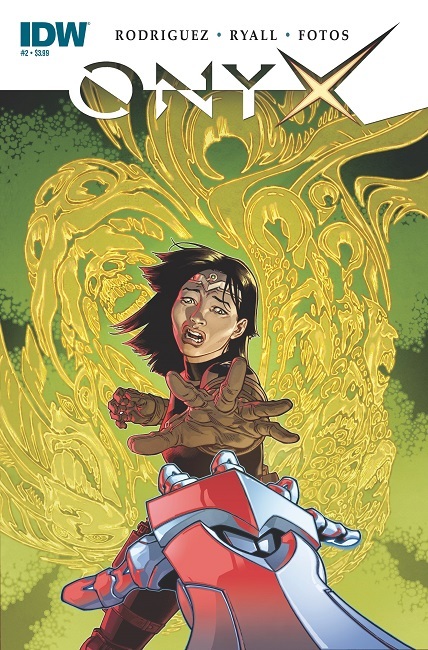 With a lack of character development and a fairly simplistic, action based plot, issue 2 of Onyx hasn’t played on the world building of the previous issue. Instead it reads like a huge chunk has been left out so the writer can get to the ‘good’ stuff, i.e. the violence.